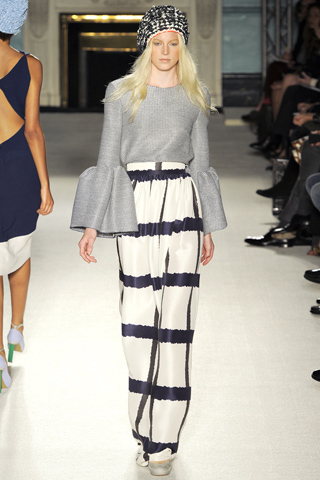 Roksanda Ilincic has been showing her collections at London Fashion Week for the last 3 years. In this time, she has cultivated a line known for its beautiful construction and unique color combinations, as well as its consistent nod to 40’s & 50’s Parisian haute couture. In doing this, she has captivated quite a large celebrity audience including Gwyneth Paltrow, Kate Hudson, Margherita Missoni, Rosamund Pike and Cate Blanchett. She also caught the attention of Mattel (that’s right…the makers of my favorite teeny tiny Blonde – Barbie). Recently, she designed the clothes for 50 limited edition Barbie Dolls that were sold at Colette in Paris and Browns in London. By the way…I think I just realized my dream job. For her spring 2012 collections – Roksanda really rocked the bells. Well – the bell sleeves anyway. Here are my favorite looks from the runway. Barbie would totally wear this! This is my favorite look (yes...even over the pink!). I think she looks so chic - and yet somehow completely effortless. And the shoes, with the little red ankle strap, are the perfect touch.